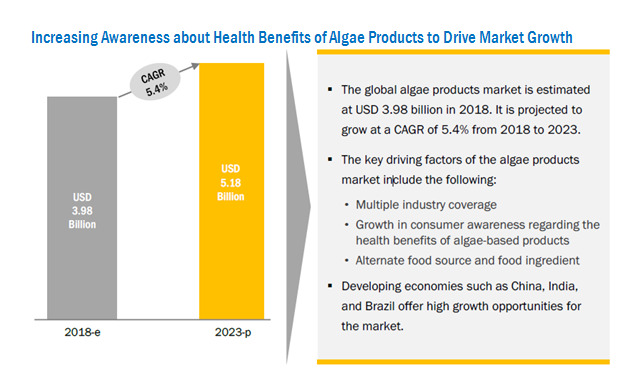 [138 Pages Report] The algae products market was valued at USD 3.78 Billion in 2017; this is projected to grow at a CAGR of 5.4%, to reach USD 5.17 Billion by 2023. 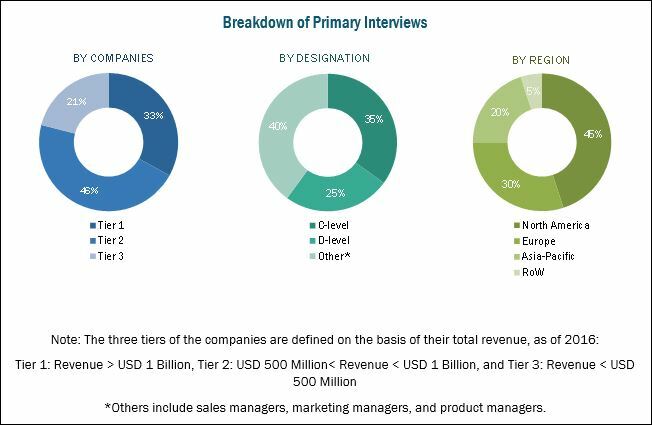 The basic objective of the report is to define, segment, and project the global market size for algae products on the basis of application, type, source, form, and region. The other objectives include analyzing the opportunities in the market for stakeholders and providing a competitive landscape of market trends, analyzing the macro and microeconomic indicators of this market to provide factor analysis, and to project the growth rate of the algae products market. This report includes estimations of the market size in terms of value (USD million). Both, top-down and bottom-up approaches have been used to estimate and validate the size of the global algae products market and to estimate the size of various other dependent submarkets. The key players in the market have been identified through secondary research (from sources such as press releases, paid databases such as Factiva and Bloomberg), annual reports, and financial journals; their market share in respective regions have also been determined through primary and secondary research. All percentage shares, splits, and breakdowns have been determined using secondary sources and were verified through primary sources. The figure below shows the breakdown of profiles of industry experts that participated in the primary discussions. The key players that are profiled in the report include BASF (Germany), DowDuPont (US), DSM (Netherlands), Cyanotech Corporation (US), Cargill (US), Kerry (Ireland), Ingredion (US), Corbion (Netherlands), Fenchem Biotek (China), and E.I.D. Parry (India). The global algae products market is estimated at USD 3.98 Billion in 2018 and is projected to grow at a CAGR of 5.4%, to reach USD 5.17 Billion by 2023. Algae-derived products find applications in multiple industries such as food & beverage, feed, nutraceutical, personal care, and pharmaceutical. This is expected to be a major driver for the growth of the algae products market. Moreover, the direct consumption of algae as a food product makes it a reliable food alternative with high nutritional value, which is a necessity for the growing population. This factor can also be considered as a driver for this industry. On the basis of application, the food & beverage segment accounted for the largest share, followed by the nutraceutical and dietary supplement segment, in 2017. Algae-containing food & beverage products are gaining popularity due to greater awareness regarding the health benefits of these products. Growing consumer preference for alternative protein sources has also led to the demand for algae-based food ingredients in convenience food and health drinks. Moreover, the growing vegetarian and vegan population in North America and Europe is expected to drive the demand for algae products in food, leading to the market’s subsequent growth. The algae products market, on the basis of type, is segmented into lipids, carrageenan, carotenoids, algae protein, alginates, and others (that include dried algae, algal flour, and agar). Lipids accounted for the largest market share in 2017. Algae have become the key alternative sources for the production of lipids to fulfill the growing demand from the vegan population. On the basis of source, brown algae-derived products accounted for a larger market share in 2017, followed by blue-green algae. Brown algae (seaweed) possess nutraceutical properties; they are anti-hypothyroid, anti-rheumatic, antibacterial, anticoagulant, and antioxidant; hence, they find applications in the nutraceutical industry as well, contributing to the growth of this market. North America accounted for the largest share of the algae products market in 2017. 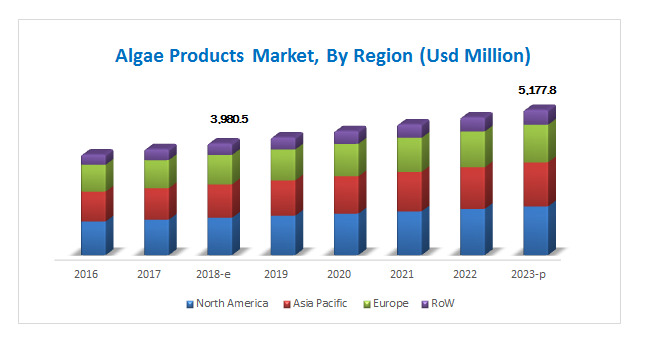 This market is driven by the rise in health-conscious consumers due to the growing incidences of diseases and conditions such as diabetes and high-blood pressure, and also the high demand for plant-derived protein that has been fueling the market for algae products. The major restraining factor for the algae products market is the impact of weather on algae cultivation. For instance, changes in rainfall pattern, occurrences of natural calamities such as floods and storms will hamper the production of algae, particularly in Asia Pacific and South American countries and in some parts of the US. Companies such as Cargill (US), DowDuPont (US), and BASF (Germany) have acquired leading market positions through the provision of a broad product portfolio, along with a focus on diverse end-user segments. They are also focused on innovations and are geographically diversified.